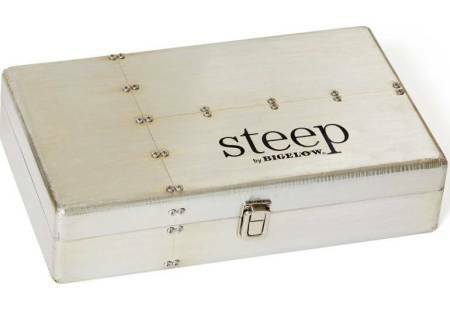 Our uniquely crafted tea chest features our steep by Bigelow teas. 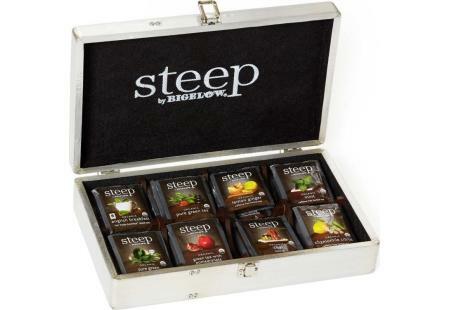 steep is a premium line of USDA Certified organic teas that creatively blends exotic, on-trend ingredients in unexpected and uniquely flavorful ways. Tea Chest is crafted with a wooden core, covered with brushed metal and trimmed with metal studs. 64 Tea bags in all. Dimensions: 14.75" L x 10.25" W x 4.5" H.